When it comes to our tech, most Americans don't care to delve into details of how it works. It's only when we run into a problem or are in the market for a new device that we get up to speed. And then we hold onto that information, despite the fact that tech changes rapidly. 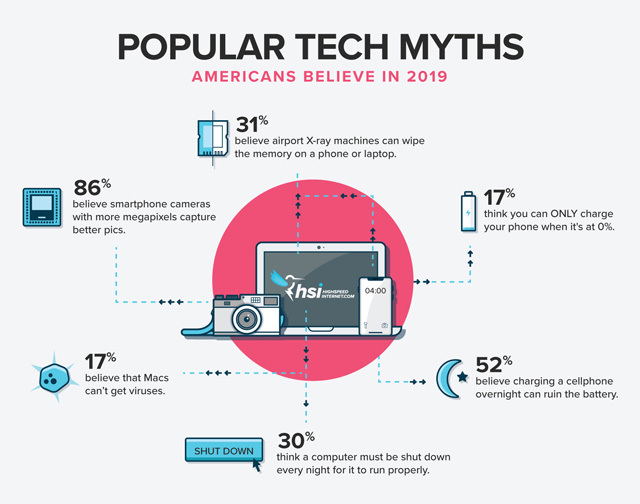 So it's no surprise that the following eight tech myths are still believed in 2019, per a study by HighSpeedInternet.com of hundreds of U.S. households. While megapixels do count, they don't tell the whole story of picture quality. Sensor size is very import – the larger the sensor, the more light it can capture. Light translates into detail and depth of color. The quality of the lens is also very important. When comparing cameras, you should always look at the speed and magnification of the lens (look for an f/2.8 at the highest – the lower the better), the image sensor size and megapixels and then take a look at the hands-on reviews. Once upon a time, best practices mandated that you not leave your phone on the charger overnight. The circuitry that prevented overcharging was not built into the phones so the battery would overheat and the battery life would diminish over time. Now, phones have protections built-in to prevent overheating and overcharging. So feel free to plug in overnight. While it sure seems like your phone slows down just about when the next model is due to ship, there's no conspiracy here. There are a number of factors that make it seem like your old device is slow. New phones often have faster processors and more memory, so they are inherently faster. They are usually optimized to run the latest operating system, which may not be true of your old phone. 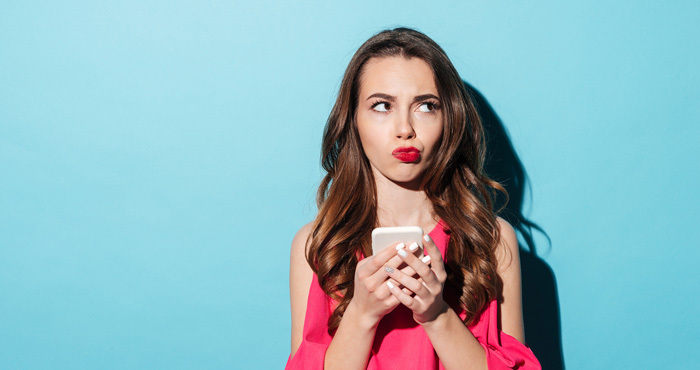 And, when app developers update their apps for the latest operating system and new, higher-performing phones, your old phone may not be able to keep up. Neither the flash memory used in phones and some laptops nor the magnetic hard drives used in some laptops can be wiped by the airport X-ray machine because neither is sensitive to X-ray radiation. When you power up your computer, it receives a surge of power as everything restarts. With older computers, you have more mechanical parts (like the hard drive), so the surge can cause them to wear out over time. Leaving your computer on, though, can reduce the life of your laptop display and expose the internal components to heat, which can reduce their lifespan. What you should do is put your computer into Sleep Mode, which puts the computer into a low-power mode and turns off the display. If you're shutting down because you want your computer to run faster, check out 4 Reasons Why Your Computer is Slow for better solutions. While Macs are more secure than PCs, Macs are still susceptible to viruses and always have been (the first Mac virus was created in 1982). Between 2016 and 2017, there was a 270 percent rise in Mac malware and it's expected that Macs will continue to be a target for hackers. Not only can you charge your phone at any time, but it's also not good to wait until your phone is out of power before recharging. Your phone's battery has a finite number of times it can be fully charged, usually around 400 or so cycles. If you charge your phone partially, you're only using a portion of the charging cycle, so you can charge it more times. Lithium-ion batteries, which are used in most phones, last the longest when kept 30 to 80 percent charged. Deleting files doesn't remove them from your device. Even if a filename doesn't show up on the list of available files, the file data is still there until it is overwritten. So please follow our steps to safely get rid of an old computer, when the time comes. Which of these points also refer to tablets-say, 2017, 2018, 2019 year tablets? Thanks. Para 4. While solid state memory devices are not effected by the X-ray radiation of devices they are usually exposed to like security scanners or even medical x-rays they can have bytes damaged by higher energy x-rays. Para 6. The 1982 virus was an Apple II boot sector virus called Elk Cloner. The nVir virus was the first real Mac virus.